Today, here are quick mini-reviews for two summer sequels: 22 Jump Street and How to Train Your Dragon 2. Starring: Channing Tatum (White House Down), Jonah Hill (Superbad), Ice Cube (Friday) and more. 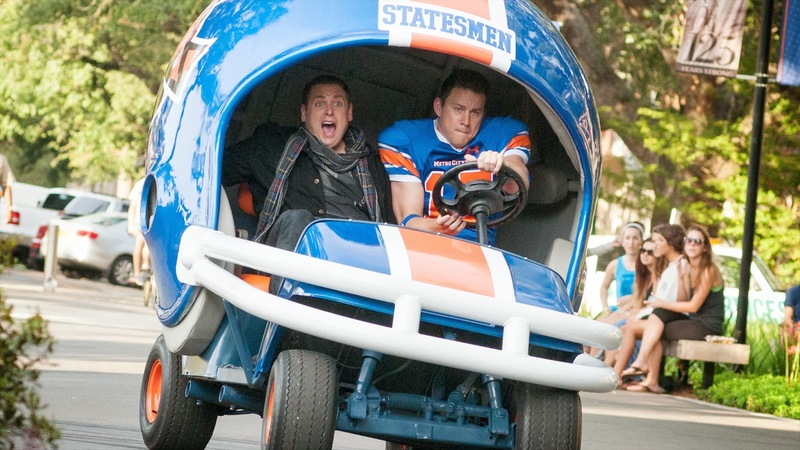 Taking jabs at sequels in general, 22 Jump Street surprisingly is one of the best sequels out there when it comes to comedy…and movies in general. Tatum and Hill are at it again and if you thought that a sequel to the surprise hit of 2012 was doomed to be terrible…think again. 22 Jump Street is hilarious! Following Jenko and Schmidt in this collegiate caper full of electives and explosives is a trip down movie memory lane that begins right were the first one began and keeps up the level of laughs throughout. A fun mix of entertainment, humor and good ol’ fashioned police work, it is as if they secretly filmed this sequel at the same time as the first one and just didn’t tell anyone. A lot is the same…and some may not like that (yours truly included)…but admittedly it works. Repetitive and redundant with the same mission as before (“Infiltrate the dealers, find the supplier.”), this film may subjectively be just as funny, and still perhaps even funnier, than the first. Giving more time to some of the additional characters (Ice Cube) and continuing some of the same gimmicks, this buddy cop mission brings some of the best out of all the actors involved. Viewers will be hardpressed to stifle laughter and giggles throughout this film. With both of the leads in their element, this film succeeds in creating laughs as a result of raunchy and raucous humor, making fun of itself and continually raising the level of adventure throughout. Although the end is predictable, the journey is full of surprises. It’s fun to watch Jenko and Schmidt find their way in college and seeing the crowds they gravitate towards and how those identities appear to become more important than their real identities (sound familiar?). Getting swallowed up in the mirage of their mission, you will find yourself captivated by their shenanigans, character chemistry (bromance) and the overall “whodunnit” of the movie. With one of the best opening and end credits sequences in a comedy since Tropic Thunder, 22 Jump Street brings audiences right up to speed with the series’ past and leaves you with a taste for the series’ future. 22 Jump Street is hilarious, not for kids, but hilarious! Combining Rush Hour with Animal House with a little bit of Old School, it’s definitely a street well-traveled but not traveled well by many comedies. 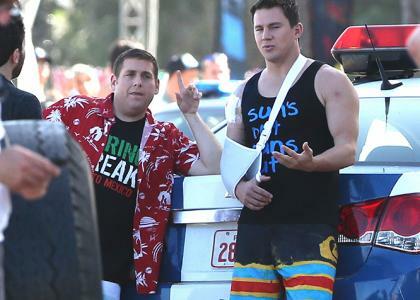 22 Jump Street has found the road (however repetitive) to success. Starring: The vocal talent of: Jay Baruchel, Gerard Butler, Cate Blanchett, America Ferrera, Jonah Hill and more. Rating: PG for action and mild humor. I gotta tell ya…I was let down by this one. I know, I know…”boo,” “hiss,” and all that jazz. How to Train Your Dragon was arguably the best animated feature of 2010 (rivaled by Toy Story 3 and Despicable Me) and I LOVED everything about it, including the epic 3D. The sequel had big shoes to fill and it looked up to the challenge. I did have my doubts when it appeared that all of the trailers after the first one divulged all of the important surprises and parts of the plot. 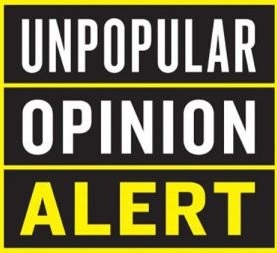 For those who managed to not see any subsequent trailers, there remains more of a charm and surprising element to the film that may increase your overall enjoyment. However…How to Train Your Dragon 2 gets the excitement built up and goes nowhere for the majority of the film. And after extensive coasting on the thrill of seeing the beloved characters again it soars to great heights of anticipation only to fall to disappointment with its predictable story and unsatisfying emotional pulls. Don’t get me wrong…kids will LOVE it and audience members of all ages will find plenty to smile about and to like, BUT, it just doesn’t carry the same thrill and charm as expected out of this sequel. 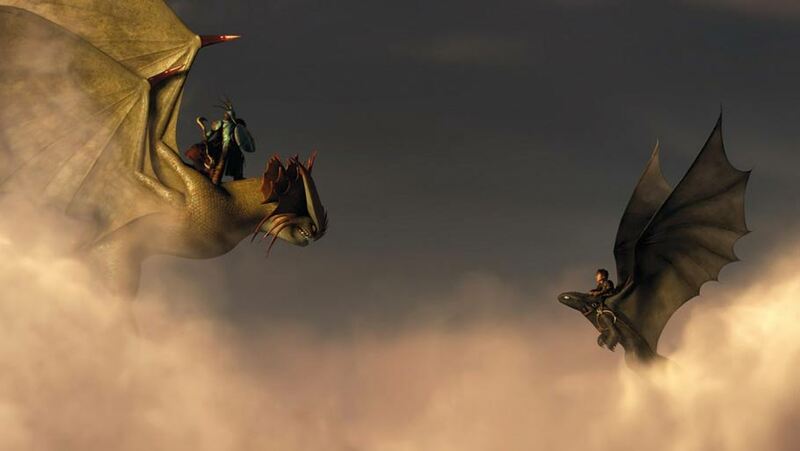 The spoiling trailers notwithstanding, HTTYD2 will not only bring and take back happiness quicker than you can say the word “dragon,” but it also does the same with ultimately useless characters…dragons included, sadly. I’m not saying I hated the film, but it definitely has its opportunities in comparison to the first. Them: What should we change about the story? haha. I jest…it’s not ALL bad. As a matter of fact, I hate using that word in this review. I just was expecting more and wanted more but got little. It is fun when there are dragons, but this one is heavy-handed in its moral and course of self-discovery and I found it to be lacking in fun, friendship and more of that epic flying. I did enjoy the music and the animation is still gorgeous. And DreamWorks has done an EXCELLENT job at portraying humor through non-speaking characters and facial expressions. Though not as emotionally light and fluffy as the first, this one dares to take things to the next step which is admirable. I wouldn’t call it the “Empire Strikes Back of animated sequels” but it is still a film families can enjoy together…and that, I think, is one of the main points of the movie altogether. Previous Time to Vote Tuesday (Special Edition): The Search for Mary Jane Watson? I really had a great time with 22 Jump Street and I think the bits with Ice Cube were hilarious, they were responsible for some of the biggest laughs in the theater I saw it in. 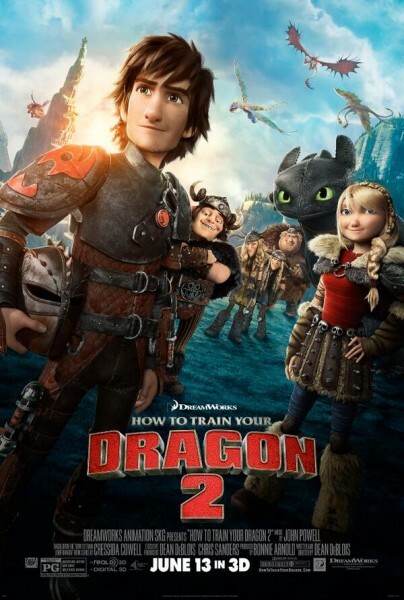 Have not seen How To Train Your Dragon 2, but will eventually check it out once it is out on DVD. 22 Jump Street had me dying. Yes, it’s repetitive, as you mention, but I thought that actually helped it.